As seen and heard on BBC Radio 4, BBC Three and Comedy Central Online. 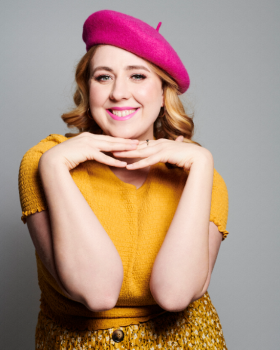 In 2018, Helen headed to the Edinburgh Festival as part of the prestigious Pleasance Comedy Reserve. This year, she will bring her highly anticipated debut hour to the Edinburgh Festival. She is also a writer and performer for thehookmag.com. Helen honed her comedy skills, performing in English, to confused Berlin locals. You can now find Helen’s creative writing, charming attitude on stage and special love of pop music all over London. Helen was runner up in the Max Turner Prize 2017, a Semi Finalist in So You Think You’re Funny 2016 and Regional Finalist in Funny Women 2017. As featured in Stylist Magazine’s ‘Edinburgh Shows to See’.